Modular lunchrooms and cafeterias can be constructed in 1/3 the time of conventional construction. Modular construction is functional and quick allowing the end user the added flexibility of moving or reconfiguring the original enclosure with a 100% recapture of their initial investment. Free on-site design consultations available to help you customize a floor plan that works for your individual needs. 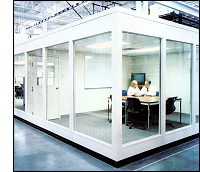 PortaFab's modular enclosures provide clean, quiet break rooms while keeping employees close. 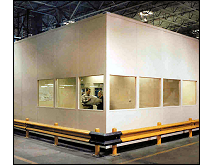 Modular conference rooms and meeting rooms from PortaFab keep training, safety and production meetings out on plant floor and close to the action. Modular construction provides clean, quiet meeting environments, which can be constructed quickly and are easy to adjust and reconfigure, maximizing long-term value. Wall panels are offered in a variety of surfaces and colors for enhancing interior aesthetics, both solid and window panels available. PortaFab modular shipping and receiving offices provide secure, comfortable working environments that secure facilities from truck drivers and outsiders while keeping employees safe and on facility premises. Shipping and receiving offices have all the benefits of modular construction, including a clean, quick construction that is easy to adjust and reconstruct, maximizing long-term value. Access to the docks is easily controlled, and drivers are provided a secured area in which to wait while trucks are loaded and unloaded. Modular shipping and receiving offices allow employees to control temperature, and reduce noise and truck fumes associated with traditional receiving docks. Two story in plant offices are one of the most cost effective ways to increase your utilization of plant space. With PortaFab's load bearing wall systems you can literally increase your office space out of the air without adding costly support columns. Color-coordinated panels, studs, doors and trim bring a professional "front office" finish to all of these buildings.